Microsoft Office 2019 for Mac (16.17.0) with VL License Utility V2.0+ | FireWolf Pl. Some of you may experience Excel installation/crash issues, please have a look at Sophia‘s comment at here. As Microsoft released a new version of Office for Mac, you can use either the integrated Microsoft AutoUpdate.app or the following direct links from Microsoft to get this update. In addition, for those who want to get the auto update feature back, please download and install the latest AutoUpdate 3.3.0 (as shown below). As some people reported that the file cannot be unzipped or cannot be downloaded properly, I have added a MEGA mirror. Also FYI, you can feel free to update to the latest version of Microsoft Office 2016 for Mac. The activation will still be working. For those who have previously installed Microsoft Office 2016 for Mac 15.13.x and “activated” it via creating a certificate and patching the MicrosoftSetupUI.framework, please COMPLETELY REMOVE your previous Microsoft Office. Download and mount the disk image file. Double-Click the FWMSO2016VL.app. OK, finally I completely rewrote the utility. Problem fixed. 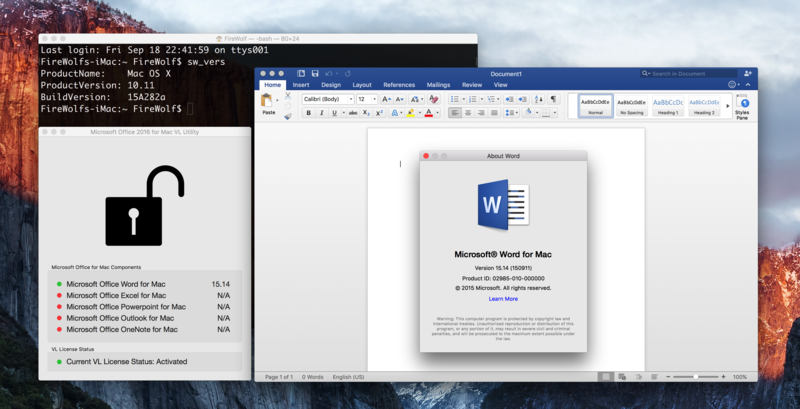 This new Microsoft Office 2016 for Mac VL Utility V2.0 has been tested against Office 15.13.1 and 15.14.0 under OS X Yosemite 10.10.5 and OS X El Capitan GM. This app is created three years ago and is not signed by a developer certificate, so you will receive a prompt saying that the application is corrupted and should be moved to the trash bin nowadays. Please navigate to FWMSO2019VL.app/Contents/MacOS/ in your Finder, open the terminal, drag the FWMSO2019VL binary to the terminal window and press the “Enter” key. The lock icon no longer indicates the current activation status correctly, so you need to click the lock/unlock icon and follow the prompt to activate your copy. Once you activate your copy successfully, you no longer need this utility unless you reinstall your system. Extremely simple. Click the Lock icon to activate your Office 2016 for Mac with VL license. For your convenience, this new utility will display your currently installed Office version and VL license status. How full clean office 2016. thanks ! Windows for mac VL Licence works a treat. Will it also work on any future Windows updates too? hey, I can not unzip the utility and can’ find the error. Can you help me? don’t use the browser to download, the file is 9MB. This utility works perfectly. Install your Office Apps, run VL Utility V2, open your apps, done. Tested against Word, Excel and Powerpoint 15.14.0 (Yosemite). Thank you for the awesome work. Keep it up! thanks bro, the patch works perfectly!!!!! Hello,What is the unzip password of FWMSO2016VLU2.0.dmg??? sorry,i just found that i downloaded a uncomplet package. VL cannot be open. can you upload to site again? I checked the file on the server. It can be executed properly. I had downloaded Microsoft Office 2019 for Mac but it’s not work well. My Mac with version: macOS Mojave 10.14.3 (MacBook Pro Retina 2014). 1. Impossible take excel/work or any things else to desktop. 2. Impossible open new excel/work, just can open new when open old excel/work. Please help me how to solve. With this patch, Office crash every 3 minutes. If you have used the so-called “Office 15.13.1 crack” patch with a .PKG extension, I suggest you reinstall your computer. Else if you have applied the binary patch before, you have to do a clean install of MS2016. Hello, first of all thank you for your work! After patching I’m not able to login into my one drive free account, the login option is not responding, is this because of the patch? how can I solve it? I don’t think this is related to the patch cuz I just tried to login in my account and nothing wrong there. If you have previously applied any binary patch, tried to remove them or do a clean install of Microsoft Office. The link for last version to download are multilanguage? Yes, those installer are multilingual. Thank you, so to have last version at this moment i can download those 5 pkg and no other iso or stuff right? Or there are other pkg for other office suite program? You can just download these separate installer. For instance, if you want to install Word, just download the Word pkg installer. If you do not want to install Outlook, simply do NOT download the Outlook installer. I have the same problem 🙁 the utility says is activated but when I start Word, Excel etc. says is not activated. Try to force to “reactivate” it using my utility. I used your Patch for Outlook 15.17, it works fine but It gets deactvated every next day. when date changes it need reactivation using patch. Any permanent solution please? That’s really weird. I don’t have such issue like this. Have you ever uninstalled Office 2016 before or used any other binary patch to skip the activation or installed Office 2011 before? If so, please follow the uninstallation guide provided by Microsoft, try to completely remove your Office 2016, and reinstall and activate it. If you have Office 2011 installed on your computer, unfortunately Office 2011 will currently break the activation by my utility. How to do this? force reactivate? Hi pal, i did it, but did not worked. Running mojave with your office 2019 and patch. followed all instructions correctly. while the patch shows “green”, the app still asks for activation. any clue ? I am having the same issue in Mojave. Hey bro, can you say me if using your last tool to activate office then it will be possible to update automatically or manually without re-activate again with tool? In theory, it will be possible to update automatically without reactivate again. And I believe it will be so. I can’t download the file. Always the download stop at 1,5/2 Mb… Can you send me the file to my mail? It worked perfectly. Thanks a lot for your great effort! BTW, May I upgrade it to 15.14.2 and still keep it activated? Glad to hear that from you. Try to upgrade to 15.14.2 and the activation should still work. Thanks again, it worked perfectly after updating to 15.14.2. I’m unable to extract path from your zip file, could you give me some suggestions? howto update products without ms autoupdate? Try to redownload the file. The zip package size should be 9MB. Feel free to leave comments if you are still unable to extract the ZIP file. The power point crashed this morning. when I start it again, it started asking for activation. Have you installed Microsoft Office 2016 and activated it via other method before? If so, please completely remove your previous activation. I actually did install other version before, but I don’t know if I uninstalled them correctly. I follow some instructions online, it claimed that the office will be completely uninstalled if I follow it step by step. May you please sugest your way to uninstall office 2016? I would like to try again. Are you using OS X El Capitan? If so, it is a known issue that Microsoft Office 2016 for Mac may randomly crash under OS X El Capitan. I get a message on Excel (15.14.0) saying I need to activate the product. It will not allow me to save files at the moment. I have tried repeatedly your key but it does not change anything. I have also Excel 14.5.5 installed with the other Office of that release. I also have Word, Outlook and Powerpoint 15.11.2 installed. Well that’s weird. Oh, I see you have Excel 14.5.5 installed which is a part of Microsoft Office 2011. Do you have any other Office 2011 components installed on your computer? Because when I was writing this VL utility, I didn’t consider that someone may have previous Office VL products installed on their computers. Are Word 15.11.2, Outlook 15.11.2, Powerpoint 15.11.2 activated by my utility? If not, are they activated by other patches (for instance MicrosoftSetupUI.framework patch) ? In addition, could you please post a screen capture including the VL Utility window and Excel 15.14.0 window? Word 15.11.2, Outlook 15.11.2, Powerpoint 15.11.2 were activated with the MicrosoftSetupUI.framework patch, not your utility. & yes, I have the other 2011 Office components installed. You are god. It works with fresh install of 15.15 Hope you keep making these to make people happy. Hi Firewolf, I just have a stupid question, can I actually sign in to a microsoft account with my office? do I get trouble like killing the activation that I applied? Hi Firewolf, I don’t know why my post was gone, looks like not successful post. Anyway, my question is, can I really login to microsoft account? My utility does not provide deactivation function. And I can make sure that my VL utility will not cause the crash. Try to do a clean OS X install and do not use any other MSO patch, especially that .pkg patch and creating a custom certificate method. Yesterday, I instaled Microsoft Office 2016 15.14.0 in my iMac El Capitan. With this patch, I will have Microsoft Office 2016 for Mac licensed and free? I run the patch but I don’t know if my version continue being an evaluation version. Yesterday I installed Microsoft Office 2016 in my Mac with OS X El Capitan. I used your patch and all programs run correctly, but my question is, ¿are all programs licensed or I must license them for use later 60 days of evaluation? It is permanently licensed. Feel free to upgrade to any further version. Replies are moderated to avoid spams. I appreciate your understanding. I updated office 2016 yesterday with OSX El Capitan and now nothing is activated. However, with the program you created it says that everything is activated. Just click the unlock icon to force reactivating Office 2016 again. I was having the same problem, but I off my wifi and 4/5 time do activation(click on lock icon it will ask for your password) its work fine for me . by the today is my first time using Mac some more install software . Ur done very job.keep it up. Thank you so much mate!! !, works great!!! I saw it’s not possible to use your activation app on OSX lower than 10.10. I’m stuck at 10.9.5 as my Air is quite old so i don’t want to update to El Capitan. Is there a way to make that app useable? Microsoft Office 2016 for Mac is not available under OS X Mavericks. So why would you want to make the app useable under 10.9.5? FYI, this utility is written in Swift. I will check whether it can be run under Mavericks. Don’t use the browser to download!!!! 1.5M is incorrect!U need 9M files. Chinese user pls use Thunder to download! Hi. I uninstalled previous versions of Microsoft Office and installed Version 15.14 as linked above. Patch Worked perfectly, except for windows. Followed tutorial on how to uninstall Office completely, yet after reinstalling, and running the patch, it doesn’t work on any application no more. Is there anyway I could uninstall this patch as well then reinstall it? It’s automatically initially unlocked each time though office apps still ask me to login. Thanks! Try to click the lock/unlock icon again to force reactivating. BTW, my utility will not automatically unlock for you each time. Hello again. Thank you for your propt reply. I once again untistalled all microsoft applications in the applications folder, so as with the files in the hidden folders in /Library/Containers and /Library/Groupcontainers . This time, I installed 15.15, and restarted my machine. However, upon running your tool once again, after a fresh install and reboot, it still starts off as already unlocked. When I click the icon I am greeted with “Your current copy of Microsoft Office 2016 for Mac has already been activated with VL license. Do you still want to reactivate again?” I click contiune, but upon running a Microsoft office app, it still asks me to sign in to activate. Hoping to hear from you soon! Kudos to your tool! THERE YOU GO JOB DONE! Does VL license utility work for 15.17.0 also? Thank you very much. This was very helpful. Now, I can take me time and evaluate the software in real life before deciding if I want to pay for the upgrade. Got it to work! Just deleted more “hidden files”. Ran your application again, and was able to unlock. Hello, I did almost all the same work as Gerry — delete all apps in app folder and delete files in Library/Containers as we as Library/GroupContainers. The utility did actually show activated but every Office app still needs to be logged in. I noticed that you said Gerry needs to delete more ‘hidden files’ and what do you mean actually? What files shall we delete apart from those he mentioned? FYI, my office version is 15.14.0 and Mac is Yosemite 10.10.1 with a Chinese system. Wait for your reply and thank you! Actually I followed this link to uninstall previous Office: https://support.office.com/en-sg/article/Troubleshoot-Office-2016-for-Mac-issues-by-completely-uninstalling-before-you-reinstall-ec3aa66e-6a76-451f-9d35-cba2e14e94c0 ； Any comment or suggestions to confirm that I really did delete all the files associated with previous Office? Good news! I uninstalled the Office once again and it works except for the OneNote ( I downloaded Excel, Word, PPT and OneNote). What’s your comment on this 3/4 success? Because OneNote does not require activation or Office 365 subscription. I am currently downloading the application on both safari and chrome and they are not downloading properly. Is there any other way that I can get those two? Thanks for replying as soon as possible! Hello. I cant unzip the VL file. How do i do it then? PLS REPLY. Just report to you that latest 15.16 with El capitan 10.11.1 works just fine. The VOL patch still working!!! really appreciate it Firewolf, all office works fine with my El Capitan. I got one question though, I somehow click the unlock button twice from your VL. So far I got no problem, but will it cause problem with my general function later on? Once you have activated Office 2016 successfully, you will not get any problem later. Does this patch remove the Microsoft AutoUpdate feature? I can’t seem to find the Update option in the Help Menu to check if new versions have been released? It’s a great feature, but I would like to reactivate it to check if new versions have been released. Thanks! It is because Microsoft does not include the Microsoft Updater.app in the individual *.pkg updater. I will add this feature in the next version. Thanks a lot, it works perfectly, from Brazil. LITERALLY THANK YOU SO MUCH U SAVED MY LIIIIIFFFFFEEEEEEEE!!!!!!! Hi there! First, thanks so much! Second, it’s not working for me. When I uninstalled all 2016 apps and reinstalled them, ran the patch…your app said they were activated, but MS said that I needed to activate and won’t let me open any of the applications at all. Any ideas? I feel like your instructions are clear, but I don’t know what I’m missing. Thanks a ton!! So first close any Office applications and then try to click the “unlock” icon and there will be a popup saying that do you still want to reactivate again. Click continue, relaunch Office, and check whether they are activated. The reason may be that you have not uninstalled Office 2016 completely. I could download the FWMSO2016VLU2.0.dmg, mounted, but when I try ro open the app, I can’t. OSX 10.10.5. – What to do? That’s weird. Hmm, try to allow apps downloaded from anywhere in the System Preference > Security & Privacy. Sorry, what do you mean by “downloaded VL license”? If you want to activate your Microsoft Office 2016 for Mac, you just open my utility and click the “Lock” icon and follow the prompt. I downloaded attached the file “FWMSO2016VLU2.0.dmg” on your blog. I clicked to execute the key icon of the file. Thanks. Works awesome. U r awesome! And that’s a rad wolf picture! It is probably because you have not removed the previous version of Microsoft Office, i.e. Microsoft Office 2011, completely. I suggest you follow the instructions provided by Microsoft to completely remove both Microsoft Office 2011 and 2016 from your computer. Then try to reinstall Office 2016 and activate it via my utility. I used a script downloaded somewhere on the internet to activate 15.11 version of Office 2016 and that worked perfectly, after I updated the version to 15.17 I used your app to activate it, it worked but after a reboot I have to use it again everytime. I’m running Office 15.17 on OS X 10.10 with version 3.3 of AutoUpdate. What do you think caused the problem, how can i solve it? Thank you! I don’t know what script you have used. So no idea without detailed information. If the script I used before will affect my activation of the new version, here’s the link to the script I used. The VL tool does not open on my computer. Any help or another link plz? Go to System Preference.app > Security & Privacy > Allo apps downloaded from: Anywhere. Hey mate, extremely awesome and super easy to use. One time success with Word, Excel and PowerPoint. Keep up the good work! Thank you for this. I installed Office 2016 on a new Mac on an air-gapped network and Microsoft had no way for me to activate and use the product. Though I have a key that I have paid for, I was forced to use your solution to activate the software that I paid for. How short-sighted for Microsoft that they didn’t provide an offline activation mechanism. There are at least hundreds of thousands of computers (maybe millions) that now cannot upgrade to Office 2016 because there is no way to perform an offline activation. They’ll either do what I did and use your tool, or just quit using MS Office. they all directed towards the Terminal App where you had to copy & paste from the Patch or insert the Patch into the Frame works Folder. And it all worked flawlessly apart from Excel that file was corrupted so I went elsewhere and download it from another site. the microsoft excel cannot install.. they put got error.. so how?? words n power point can install.. Thank you so much for making this app. Easy. Flawless. I really appreciate you making this app available. I have no problem paying for software (even MS’s stupid prices) but not without sufficient time to try out the software unlimited for a couple of months. After wasting so much time, finally i found this crack which worked and did the job. bundle of thanks. Does it work with Microsoft_Office_2016_Installer_15.18.pkg ? How can i remove the VL Licence? With a Copy of 15.18 (160109), this Patch Still Works. Block any internet acces for the office Apps. Thanks a lot Firewolf, Geat Job!! Hello I was trying to log in to my account on OneNote. But everytime I tried, it said “The authentication session has expired. Please sign-in again.”. I reinstall OneNote again, it still was in the same way. Any suggestions to fix this? I just tried the OneNote on my machine and it seems that everything is working fine. I am sorry that I was unable to revive your issue. OneNote is provided by Microsoft for free, so it does not require any VL activation. So I guess your issue may not be related to the activation utility. Hello, I installed the Volume License v15.13.4 with patch updater and applied the Utility V2 and it says everything is activated. However, when I go to launch an application for the first time they all want you to sign in. Shouldn’t there be a skip option available? I can’t complete the install with it? Can you help me? On a MacBook Pro using El Capitan. Try to run my utility and click the big “Unlock” icon. It will let you reactive your Office 2016 for Mac. Let me known if you have further questions. I downloaded all the files (6 of them) and installed ok. Then ran ur utility, it shows green for all the components but for the current status it says N/A and shows red. Therefore my apps still ask for activation. Can you please tell me what to do with that? When you run my utility, you need to click the lock icon to activate your Office 2016 for Mac. Hi. When I check of update it says I have to download Microsoft Auto Update 3.4.0. Can I install it an update the office for the new version ? My actual version is 15.17. Thank you very much and great job ! Yes. You can either download the Microsoft Auto Update first or directly download the new version of MSO to update. I did all the steps and the suite 15.19.1 is working fine, stable, but I can’t get all the features such as the morph transition on PowerPoint, which is available in the this update to 365 subscribers. Any idea of how can I enable all the features? Is the Mega Mirror link down? Thanx a lot 4 sharing. Easy install and VL key tool is perfect. Such an amzing guy! !1 Thank you so much!! Hi, are the auto updates working in 15.20 ? Auto updates are working with 15.20. Please make sure that your Microsoft Auto Updates.app ‘s version is 3.4. I have upgraded to Mac Os 10.11.3 El Capitan on an iMac bought mid-2010. Very recently I also installed Office for Mac 15.20. A problem with Excel from that download is that, frequently, a row at the top of a page will not hold text as it is typed in, requiring me to insert a fresh row and re-type the input. Please advise what I can do. i have installed Microsoft 2016 and i already have a product key. i want to activate using the product key and not having to sign in. Is that possible? if yes can you help me? So you still have to sign in your Microsoft account even though you already have the product key. the issue is my friend bought it for me using his account and gave me the product key. then i have been trying to activate it and its asking me to enter his account information. i contacted Microsoft to see if they can transfer the product key from his account to my account and they said no. So i used your activation thing to activate microsoft but i don’t know which product key you used. I wanted to see once its activated if there was a way to go and change it to my product key. do you know if thats possible without having to login? also if i keep your activation thing, can i update microsoft as usual? also if i keep your activation software, can i update microsoft as usual? I’ve wiped and downloaded the updated powerpoint 2016 (the .21 version) for Mac, wiped the V2.plist file and regenerated with VL, but I still don’t have morph transitions, which are the only reason I want to update from 2011. Has anyone been able to get morph to work this way? I set up a one month trial Office 365 subscription and verified that Powerpoint morph worked. Then ran the crack and morph disappeared. So this seems to be a real limitation at the moment. Hi, I downloaded version 2.0(37) and run, it worked perfectly, but any time I close any Office app, it asked to activate again. So I need to run the VL Utility again and again. Is that any way to fix that? Did you also have Office 2011 installed on your computer? If so, please uninstall it. The activation work from which version? Thanks a lot! Just downloaded Microsoft Office 15.22.0 and used the VL package, which says everything has been activated. The only issue I have is I am being asked to sign in to Office 365 still by entering an e-mail address. My understanding was that the VL package should have bypassed signing in. Should I uninstall and reinstall an older version or does it matter what sign in I use? Thanks! Just click the “unlock” icon in the utility and you will be guided to reactivate the Microsoft Office for Mac. Well, this is because Microsoft has updated the activation license and my utility does not get updated and therefore cannot detect the new license. Feel free to ask me if you still have any question. Reactivation worked, thank you very much for your help. Keep up the good work! Indeed, that works fine BUT as soon as I install some extended styles (for “references”), word crashes down and when it restarts, it asks me for activation… So I reactivate but the same happens… The only way is to remove the extra styles I added. The problem is that I need them. Do you have any trick to fix this issue ? Could you please post a crash log? How to uninstall volume licensing? Wie kann man nur so einen Fake reinsetzen??? What happened to your Microsoft Word? Keep crashing? Note that Office 2016 for Mac is not compatible with older version of Office for Mac. If you have Word 2011 for Mac installed on your computer, you have to remove it. Hi Firewolf, thank you so much! It work perfect and very easy! Hi , I used in office 2016 cracked suite in my mac, if I update to 15.25 version first, then use the FWMSO2016VLU2.0.dmg for crack is work or not ? Thanks for help ! I don’t know what cracked suite you are using on your Mac. You can try to upgrade to 15.15 and check whether your Office products are working or not. If not, try to use my utility. And one more thing – have you a link to some x64 version of Office suite? Theese posted above are only updates. Or it will update the x32 bit version to 64bit ? Apple’s Gatekeeper will verify the pkg installer you downloaded. So please be patient or you can manually turn off the Gatekeeper. Currently, x64 version of Office is only available for Office Insiders. Since Microsoft does not release a stable version of 64-bit Office for Mac, no link for Office x64 suite. Works like a charm! Thanks!! Hello, I wonder if this kind of version exists clipboard? If exists, how to open it? This worked for Outlook standalone 15.23 version! I successfully installed the Microsoft office and also I have downloaded VL and run it on my Mac. Its showing VL License status with green dot. But when i open word, excel its asking for activation. Here is the link of screenshot. Not working for me. Any solution? I see. Now try to click the big “lock” icon and an attention window will be displayed. Then click the continue button to force to reactive your Microsoft Office product. 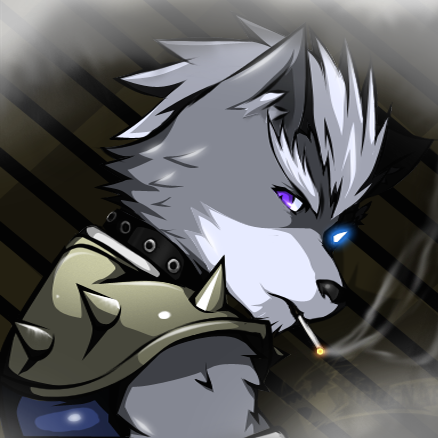 Hi FireWolf, I just want to say you are so awesome..THANKS! After installing each separately and running VL afterward each time to make sure they were unlocking..they were. I then waited til the very end to open each officially. To my surprise, they all prompted me to sign in but I didn’t. Came back here and read that I needed to open back up VL and reactivate. Did that and now everything works. The sign-in was still there but on the very bottom gave me the option to skip sign-in. I am encountering the same problem you had earlier. Would you please advise what is the back-up VL and where can i download it and reactivate it ? Noble, what you have to do is open VL again and click the lock icon and force it to reactivate again. After that, open word, excel.. and you’ll see on the bottom to skip sign-in. i have successfully installed Office 2016 15.23 and downloaded VL Utility 2.0. It shows the that all MS office (excel, word, powerpoint, one note, outlook) are all successfully activated. However, when i test and run MS office, its not working and keep asking me to sign in. Successfully installed Office 2016 15.25 and downloaded VL Utility 2.0. It shows the that all MS office are all successfully activated. In fact when run MS office, its not working and asking to sign in :-(. Click the lock icon to force reactivating Office for Mac. Thank you so much guy! You software are the best! Hackintosh El Captain Last Updated with full install of Microsoft Office 2016. Is there any way I can make a donation? Many thanks again. I click the lock icon to reactivate again and it worked really well. Thanks for your support. You could make a donation via Paypal to [email protected]. I’d just like to thank you for your awesome work on the VL patch. The zip file there is only 1.5MB and it doesn’t unzip on my machine. The mega link (8.8mb) works just fine. Just giving you a heads up. Thanks! May I ask you to help me out? That’s interesting because I have Office for Mac 15.26 installed on my computer running macOS Sierra and everything so far is working well. Did you try a fresh install? Same thing here, Office 2016 is working, but I can’t save anything anymore. I need another crack or something, does anyone know how to fix it? Every time I open the lock, it says that the app was “blocked because the identity of the developer cannot be confirmed.” Any advice? Are you using macOS Sierra? If so, type sudo spctl –master-disable to disable the Gatekeeper. I’m done but sut still can’t be opened, or this method not working on sierra? VL seems to be working on office 15.26. Thanks a lot! However, on “Word” the “look for updates” is not working. A error message pops-up. This means it’s not possible to update Office with this VL method? So what’s the error message? I just tried on my computer, and checking for updates is working fine. Hello. The message: “Internal error – An exception was detected….” (rough translation from my language). What I did was going to the “Farrukh” page you recommend and I installed the Office 2016 full suite from the link there. Then I downloaded your VL Licence Utility and ran it. A message showed up saying that Office was already activated and if I wanted to reactivate it anyway, which I did. Then Office was working fine (option to sign up but I skipped it). Went to “Help” in Word, looked for updates and the message popped-up. Do I need to instal anything else from “Farrukh” page or from yours? Solved it. Installed MAU from “Farrukh” page and no error message this time. However I guess it’s better not to update Office as I guess your patch won’t work. My VL utility does not activate Office for you automatically. You have to click the lock icon to activate. My VL utility does not activate Office for you automatically. You have to click the lock/unlock icon to (re)activate. THANKS!!!! YOU ARE THE BEST!! My regards ! Office officially updated to 15.26, and your patch worked perfectly ! Merci!!!! merci!!!!!! merci!!!!!!! You’re Howesome!!!!!! This is working fine with 15.26 but required “reactivation” by clicking the lock. Thank you. I am running on Sierra OSX and works fine. Use the mega mirror instead. From your latest release of MS Office, i found the Auto-update function has been enabled. However, do u recommend to install the updates when there is a new release being pushed from MS?? I would suggest you install stable releases from Microsoft. It is not a very good idea for those who rely on Office to install insider releases. Can I understand it as…. those updates released from the Auto-updater built inside Office might not be stable and are not recommended? Insider builds from the slow and fast ring can be considered as public betas, so I don’t recommend to install those builds unless you want to try the newest features. I have already installed those builds, though. T_T And now my Office shows a version of 15.27. Will it be able to revert to 15.26 if I re-run your 15.26 installer provided by this blog? Actually, you don’t have to revert to 15.26 because Microsoft released a new stable version which is 15.27.0 just a few days ago. I will update the new links for 15.27. Please use the mega mirror instead. Actually, I downloaded the Office full pack and run the activation crack but there is still a f******* popup to connect an email account. If is it normal, what’s the mail address ? 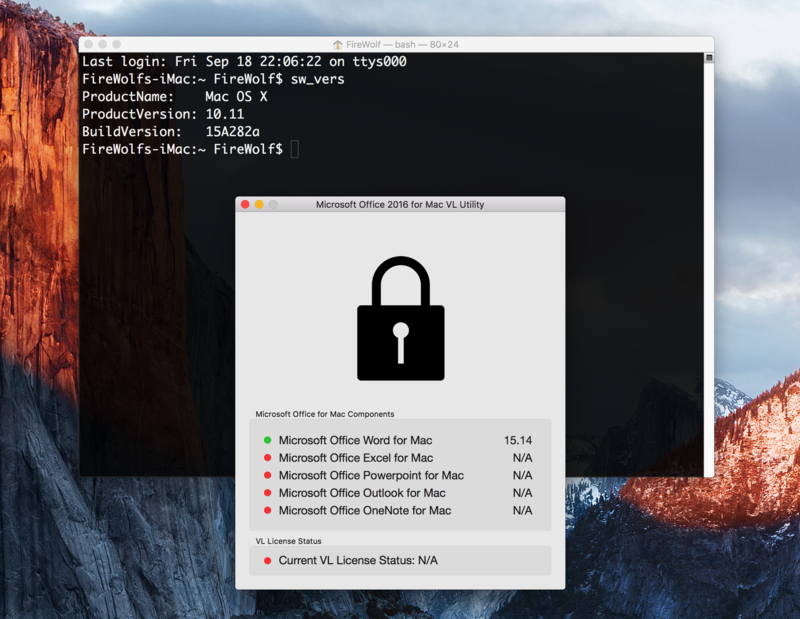 Open the VL utility and click the “lock” icon to force to reactivate Office for Mac. Hi FireWolf, I had the same problem. I tried again using Steps 3 and 4 about this address (https://support.microsoft.com/en-us/kb/2398768). After I restart my mac and run VL utility again, everything works at all. Thanks! I hope this help you too! I MacOS sierra, Word will not cause problem after installation? The version of word is recent? You don’t know how I was struggling to find any good method and files in order to retrieve MS 2016. Actually I lost MS 2016 when I have done the MacOS sierra update. I was so angry to lost it. By the way people, look out to your MS when you make the update on Sierra, because you could lose it like me. Hello, I can’t download the office at this links you’ve posted..
After Sierra update I’ve lost MS office, so I totally uninstall the suite , download yours and reinstall , VL utility work and says Activated but I still have to fill email to activate on the software popup. I ve tried 2 times and the deinstallation was made with all library files killed and so on…. Open the VL utility and click the lock icon to reactivate your Office. OMG!!!!! THANK YOU!!!!! I’ve been dealing with this exact situation for TWO DAYS. I downloaded this key, clicked on the lock and ta da it works. Can’t tell you how happy you have just made me. !!!!!! Just click the lock icon and try to reactivate your Office. it really doesn’t work. It keeps asking me to sign to activate it. But when i rerun the lock key, it says all are activated. But when i open word or excel it asks me to sign in to activate it. i have the current version .28, using sierra..
hi! Its working now! i was just so stupid. Didnt know I had to double click the icon. Thak you so much! Click the lock icon to (re)active again. I’m running MS Office 2011 for Mac and OS X 10.9.5 Mavericks, I already downloaded and paid for MS Office 365 for Mac, but it won’t run on 10.9.5. I need to upgrade to 10.10.0, however, the only update available is Sierra, which I already downloaded and hand multiple problems with running Adobe CS6. It took two days, five Apple tech agents, and a reversal with TimeMachine to get my computer back to normal. CS6 won’t run on Sierra and I’m not upgrading to CC. Any runarounds for getting MS Office to work on my system? So in your case, you can choose to install OS X Yosemite 10.10.x or OS X El Capitan 10.11.x. You don’t have to upgrade to macOS Sierra. You need to find the app (Install OS X Yosemite.app or Install OS X El Capitan.app) to install an old version of OS X.
hi, I just installed microsoft office free trailer for a month. Is this untility works for that too? Working on MacOS Sierra 10.12.5.
this app has problem with activate msoffice 15.35 or beta,sometimes lost effection.please update it ! Thank you so much for this! Everything works perfectly. Need help. I read the entire thread, and I’ve tried so many different variations but I am not able to activate Office apps. 1) In the beginning. I’d installed Office suite 15.36.0 (mac| 10.11.6 El Capitan). I installed the suite. Didn’t run the VL utility. Logged into one of the accounts; didn’t find the licenses. Then, ran the utility. It shows ‘green’ in the app, but the Excel (and others) are not activated. I ‘re-activated’ it multiple times. Not working. 2) I uninstalled completely multiple times (full), and tried running the utility first without logging into account. It didn’t work. Every time it asks me to login into one of the accounts. 3) After multiple attempts, I tried installing only “Excel” first (15.17). Again the same issue (link for images given below. a. I’ve a secondary hard-drive (installed inplace of optical drive) which has Office 2011. It’s has OS X Lion installed. I am not sure if it can interfere with the Main Drive. b. This was the my first attempt to install Office application in this OSX copy. I haven’t used any other patch/ serial earlier. What can be a way forward? Have you tried to click the “lock/unlock” icon to force reactivating Office again? As, as mentioned in the original post, I’ve tried lock/unlock multiple times (different permutations and combinations. Didn’t work for me unfortunately). I am only trying to with Excel (15.17.0). 6) Again, click on lock/unlock icon (reactivate mulitple times). Same result with Excel. No skip sign in option. Asks to sign in. 8) Restart computer. Repeat 6 & 7. Same result. Using Sierra 10.12.6 and office 15.19.1, after patch I can open word but each time it shows “compile error in hidden module: link” and I can not use OneNote. Is that normal? What can I do now? You are using an out-of-date version of Office. Try to upgrade to the latest version. Thanks!!! It works perfectly now!!!! I downloaded Office for Mac 15.36.0 which is the latest official release from Microsoft. I tested the app without activating first and Microsoft Auto Update was working fine but when I applied your patch it activated office successfully but Auto Update stopped working and crashed every time I tried to update office from within the app. I believe your patch replaced the installed auto update and rolls it back to a previous version. Is there a way to modify your package and replace the Auto update app inside Contents/Resources/Essentials with the newest version as of today which is auto update 3.9.1? Or alternatively, disable your patch to install its auto update version at all and leave the default one installed by Office? I have decided not to install piratical softwares anymore and purchased office 365 . Can you kindly let me know how to remove the LV Utility? Just FYI, the 15.38 update running on Sierra 10.12.5 works perfectly! What exactly am I looking for to completely erase everything microsoft? 2.0 can’t activate any version I try to reinstall (tried older to the latest). “FWMSO2016VL.app” can’t be opened because the identity of the developer cannot be confirmed. I just used this on a fresh Mac install – SIerra – 10.12.6 – had a few issues with activation but could have been because I tried to open Word before patching. Ran patcher to re-activate and worked just fine. Still works. You my friend are the man!! FireWolf, can you or anyone here help me.. where to download older versions like OS X El Capitan? Thank you! If you have downloaded the OS X El Capitan app from the Mac App Store before, you can find it in the “Purchased” section. Hi, I am trying to use this on Mac os High Sierra is stating that the file ‘is damaged and can’t be opened’. I have tried downloading a copy both directly and from the mirror – can anyone help? Try to disable the Gatekeeper via terminal. i’m newcomer in mac, and found these forum…nice…it really works, does it safe / validation still active if i login with my Microsoft account? Yes, it should still be activated. is okay if i still use your patch in update office version? If you have already activated Office using my utility, then in theory you no longer need to activate it again. It should work for future Office version. Hi, when I open update it says MS Autoupdate has crashed. Is there any way to update it after applying the VL? Also, is it safe to login with MS account? Will this break the crack? is this patch still working?? mine still says i need to activate. Hi, why this? Free? No make sense, where is the trap? Full suit installed and activated. Thanks! If I had 2011 version for office suites before and I deleted them all. But I still cannot activate this new 2016 version. For 2011 version I had an account and when I open 2016 it always logged my previous account in. I guess that why I cannot activate. Any solution for my situation? Thanks. Will you update it? Thanks! I just updated to the latest 16.13 and found everything still working. i.e. signing in is not required to save files. You can try to click the “lock” icon to reactivate your Office. Thank you so much. It’s perfect. the Key programm cannot be opened on my Imac because not certified by Apple. Is the activator working with version 16.15 (180709) ? Also, once activated, can you update to the newest versions or you must reactivate each time a new version is available? It is not working with version 16.17.0 anymore, for obvious reasons, because that’s Microsoft Office 2019. Will it be possible to update for the new version? Microsoft Office 2019 Volume License has been made available today. Works with 16.27.0 updates/installers. FWMSO2016VL continues to work if you exchange the old files in the ./Contents/Resources/Essentials directory in the app bundle with the new files (2019 VL helper + plist, Autoupdate, SetupAssistant). So it really only needs a quick 2016-to-2019 update. the volume license app cannot be open. The system state that the file is damaged. Could u teach me what to do? I post a side note under the download link. Thank you. Activation is successful. Hello… Microsoft Office 2019 Volume License is corrupt or damage, not works fine… please its need repair… thanks. I modified the application even further than Joss to make the application display “2019” instead of 2018. I think I forgot to post the link. 1. the unzipped file shows as “broken” if the unzipping process is performed in an APFS formatted drive. It seems working OK in a OX Extended formatted drive. 2. I tried to apply the unzipped VL 2.0+ on a fresh installation of MacOS 10.13.6 (APFS): a) from MSO 16.17 installer package VL 2.0+ seems to work, but the “Ignore” button doesn’t show and MSO asks for licence activation b) from MSO 15.13.3 installer package. VL 2.0+ works, but after upgrading manually to 16.17 MSO asks again for licence activation. Hoping this useful for you. The previous activation does not work with 16.17. Office 16.17 needs to be activated using FWMSO2019VLU2.0+ and my disk is APFS formatted, so that isn’t the problem. I was able to download and open it without it being damaged. I posted a link to a download that should work no matter what. Is there any modification you can do for those of us on the latest Mojave? It just wont’ work. Thanks in advance! I am using the latest macOS Mojave 10.14.2 and it is working as expected. Please make sure that you have followed the instructions. You need to click the “lock/unlock” icon to activate it. for me too the patch does not work. Opening the programs, it says “waiting for licence research….” and then it opens the program without licence. tried everything but there’s no way to get the Skip sign in button. I’ve just downloaded and installed the MS Office 2019 suite from this web page and then also downloaded FWMSO2019VL from this web page also and finally executed from the terminal as the notes says to. I’ve been always unable to get the skip sign in button so I’ve tried fully uninstalling MS Office, downloading and installing the MS Office 2016 and running FWMSO2016VL but could never get it patched don’t know why. SO finally I installed Mac OS X on an external SSD Drive, downloaded again the MS Office 2019 from here, executed FWMSO2019VL from the terminal and finally got it working. So I wiped out the external SSD Drive, also erased my MacBook Air internal hard drive and reinstalled Mac OS X Mojave and after installing MS Office 2019 and running FWMSO2019VL from the terminal I could never get the Skip sign in button again, so I installed Mac OS X Mojave again to my external SSD drive, installed MS Office 2019 and patched it running FWMSO2019VL from the console but I could never get the Skip sign in button again. To me it looks like FWMSO2019VL is not able to patch/modify my MS Office 2019/2016 install. Really strange, sometimes I wonder if there any type of hidden files in the drive (in the boot sector or wherever) so MS Office 2019 knows I should Sign in and thus Skip sign in button does not show. I don’t really know what to do. Hope someone can help. I’ve never reversed engineered anything nor coded patches or Mac OS X apps but I’m a computer engineer with strong computer and web applications coding skills so if you were so kind to give me some hints or steps on what to do I could try to debug what’s going on. Hope you can help me FireWolf. Thank you for your work! I’ve followed your note under the download link, but the office seemed not patched. Same issues with both the Microsoft Office 2019 VL Serializer and FWMSO2019VLU2.0. Will not generate the necessary com.microsoft.office.licensingV2.plist preference file on a 2015 MacBook Pro running High Sierra with an SSD drive (APFS). This was doing a clean install removing every trace of the old Office 2016 installation. Multiple attempts. Same result after doing a recovery mode fresh install of High Sierra on the MacBook. So my take is that there’s an issue (at least on my system) with the volume license utilities with High Sierra and APFS drives. Curious if anyone has had success installing Office 2019 with High Sierra or Mojave on APFS drives. (no issues anywhere with Office 2016 and the original FWMS02016VL. Me too Same issue! the patch won’t work! Any workaround for this? same for me…tried all the ways, all the serializers, always ask for office credentials to activate (and lock is open using FWMSO2019VL.app – licence activated)….any help? I also have a MBPro 2015 with Mojave 10.14.2 (APFS) with MSO from the App Store 16.21 and haven’t been able to get the 2019VL app to successfully work either by opening the app or via terminal. The popup says activated but it doesn’t actually go through. Have tried rebooting, repairing permissions with OnyX in various combos but haven’t been able to get that to work either. No problems with MS Office 2019 and FWMSO2019VL.app on Mojave/10.14. I think it is a general problem for Sierra users? the matter is since i upgraded from 2016 to 2019, it is activated (green dot fo all) but still ask credentials. Works well for Office 16.18 on macOS Mojava. I’ve dragged the FWMSO2019VL file from the download folder to the terminal window and then I’ve pressed the “Enter” key, but nothing happens. I have no problem in the past with the previous version for Office 2016. My question is if I’m doing anything wrong because I have misunderstood the instructions. It seems the 16.17+ version cannot work with OSX 10.14.1, but it did quite well when I using 10.14. All the steps seems go smoothly and noting wrong notification happened when I using the FWMSO2019VL.app, however, Office still remind me to active my account. Any luck? Mojave latest is stopping me from using it as well. I can’t get the FWMSO2019VL.app to open…says it’s damaged and needs to move to trash. Latest Mojave beta. So got it to run (missed the terminal comment) BUT it still doesn’t work after repeated clicks to re-run the app, launching any Office app still prompts for sign in. is this no longer being supported? Hi do you know if the Office for Mac Activator work with the newly released Office-Pack on the MacAppStore? Thank you so much for this utility ! Activation successfully performed since early December for MSO installed on a Mojave fresh install. This new system is located on an external SSD connected to an iMac. Yesterday I put the SSD inside the -same- iMac in replacement of the original HD. Any help will be very appreciated! Thank you!